One of my earliest memories, in my culinary "career" was trimming the ends off of and preparing string beans. I would be propped up on a chair, (in order to reach the counter) and eagerly emerse myself in the relaxation of cooking, at a very young age. Nowadays I really enjoy using haricot verts. Haricot verts translates to "filet beans" and are basically the slender, tender and stylish French cousin to the American chubbier and longer green beans. Sounds kinda realistic doesn't it? This makes a beautiful, quick and easy Easter side dish! Bring a medium sized pan filled with salted water up to a boil. Fill a large bowl with ice cubes and ice cold water, set aside. Blanch the haricot verts in the salted boiling water for about 1-2 minutes. Using a spider, immediately transport the haricot verts into the large bowl filled with ice. This will shock the beans, stop them from cooking and preserve that beautiful grassy-green color! In a pan on medium heat, add the butter, shallots and a healthy pinch of salt. Cook the shallots until soft, about 2-3 minutes. Add the haricot verts to the pan. Add the mustard, vinegar, salt, pepper and lemon zest. 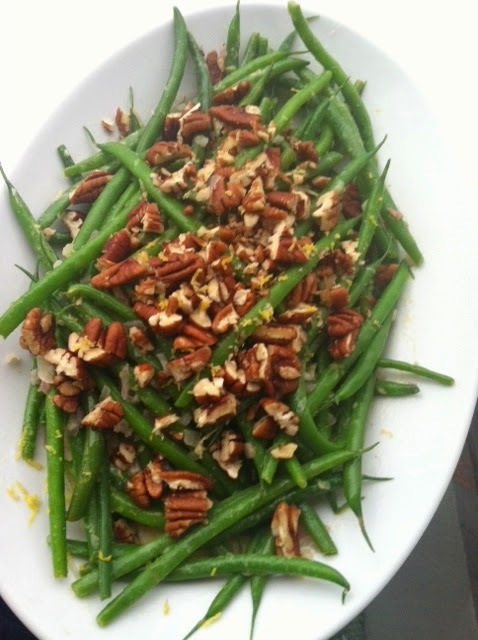 Transfer the beans to a serving dish and sprinkle with the pecans. Taste and adjust the seasonings. Enjoy! This entry was posted in Recipe,Sides,tLittle Bites by Catherine Amoriggi. Bookmark the permalink.